Expedited Thermomechanical Analysis (TMA) Services Are Available - Contact Us Today at 724-537-3131 or us.sales@wmtr.com. What Is Thermomechanical Analysis (TMA) Used For? Thermomechanical Analysis (TMA) provides valuable information on the dimensional properties of a wide range of materials used alone or in combination with other thermal analysis techniques such as, differential scanning calorimetry (DSC), thermogravimetric analysis (TMA) , dynamic mechanical analysis (DMA), or thermal conductivity. 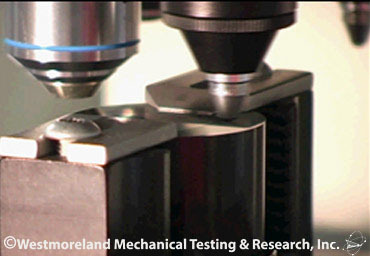 TMA provides a large amount of valuable information on solids and other materials that is difficult to obtain by other analytical techniques. TMA offers a higher degree of sensitivity compared to DSC for the detection of the glass transition temperature of highly filled or highly cross-linked materials, such as composites. This test method determines the technical coefficient of linear thermal expansion of solid materials for design purposes and to determine if failure by thermal stress may occur when a solid body composed of two different materials is subjected to temperature variations. This test uses a thermomechanical analyzer or similar device to determine the linear thermal expansion of solid materials when subjected to a constant heating rate. The change of the specimen length is electronically recorded as a function of temperature. The coefficient of linear thermal expansion can be calculated from the recorded data. For ASTM E831 Thermalmechanical Analysis (TMA) Testing, specimens shall be between 2 and 10 mm in length and have flat and parallel ends to within ±25 μm. Lateral dimensions shall not exceed 10 mm. Coefficients of linear thermal expansion are used, for example, for design purposes and to determine if failure by thermal stress may occur when a solid body composed of two different materials is subjected to temperature variations. This test describes procedures for the assignment of the glass transition temperature of materials on heating using thermomechanical measurements under compression experimental conditions. This test uses Thermomechanical Analysis (TMA) equipment (thermomechanical analyzer, dilatometer, or similar device) to assign the change in dimension of a specimen observed when the material is subjected to a constant heating rate through its glass transition. This change in dimension associated with the change from vitreous solid to amorphous liquid is observed as movement of the sensing probe in direct contact with the specimen and is recorded as a function of temperature. The intersection of the extrapolation of the slope of the probe displacement curve before and after the transition is used to determine the glass transition temperature. The glass transition is dependent on the thermal history of the material to be tested. For amorphous and semi-crystalline materials the assignment of the glass transition temperature may lead to important information about thermal history, processing conditions, stability, progress of chemical reactions, and mechanical and electrical behavior. Thermomechanical Analysis (TMA) provides a rapid means of detecting changes in hardness or linear expansion associated with the glass transition. Need more information on Thermomechanical Analysis (TMA)? - Contact Us Today at 724-537-3131 or us.sales@wmtr.com. This test describes the determination of the temperature at which the specific modulus of a test specimen is realized by deflection in three-point bending. This temperature is identified as the distortion temperature. The distortion temperature is that temperature at which a test specimen of defined geometry deforms to a level of strain under applied stress of 0.455 MPa (66 psi) (Method A) and 1.82 MPa (264 psi) (Method B) equivalent to those used in Test Method D648 . 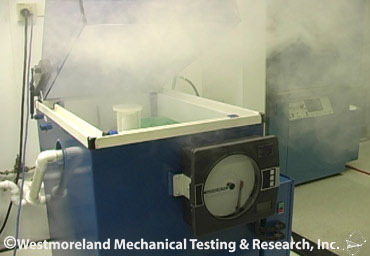 The test may be performed over the range of temperature from ambient to 300°C. This test is intended to provide results similar to those of Test Method D648 but are performed on a thermomechanical analyzer using a smaller test specimen. Equivalence of results to those obtained by Test Method D648 has been demonstrated on a limited number of materials. The results of this test method shall be considered to be independent and unrelated to those of Test Method D648 unless the user demonstrates equivalence. A test specimen of known dimensions is tested in three-point bending mode. 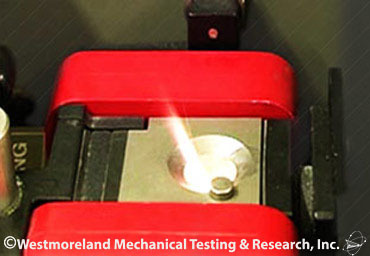 A known stress is applied to the center of a test specimen supported near its ends, as it is heated at a constant rate from ambient temperature to the upper temperature limit for the material. The deflection of the test specimen is recorded as a function of temperature. The temperature at which a predetermined level of strain is observed in the test specimen is analyzed as the distortion temperature. The specimens may be cut from sheets, plates, or molded shapes, or may be molded to the desired finished dimensions. The specimens used are ordinarily in the form of rectangular beams with aspect ratios of 1: 3: 10 for thickness or specimen depth (d), width (b) and length (l), depending upon the modulus of the sample and length of the support span (L). Data obtained by this test method shall not be used to predict the behavior of materials at elevated temperatures except in applications in which the conditions of time, temperature, method of loading, and stress are similar to those specified in the test.